Heads up if your using Red Rocket Settlements by Tarsis31. https://www.nexusmods.com/fallout4/mods/17681/? There is a small conflict with this mod that causes parts of the old style building to show up. Some float in mid air like the dome lids to the fuel tanks that were by the fuel pumps. The solution to the problem is simple though. Just load this mod after Tarsis31's mod. 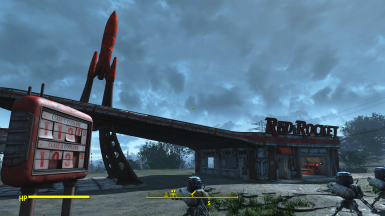 For some reason, red rocket will revert to a damaged state with the fuel arms and weird domes on the ground randomly. I have this mod basically at the last of my load order, so I'm unsure what's up with it randomly going back. do you have scrap everything? Yes, it's one of the last things in my load order. I had it before and it was fine, it just randomly stopped being repaired recently. https://www.youtube.com/watch?v=Dg23JFmJ2uQ&t=1s Watch this video to learn how to fix conflicts. One of those happens to be the Red Rocket building. Just remove that whole line from Scrap Everything by selecting the record name on the left hand side not changing the record info on the right where you see me adding the keyword. You don't have to have all of the separate mods, just whichever one/s you are using including merges. Let me know if you have more questions. You don't have to worry about the previs conflicts in the worldspace since you actually want to keep Scrap Everythings records on that. There is a recently released Red Rocket basement player home mod, Red Rocket Basement (NX-2C Edition), which I'd like to try out, but I want to avoid potential conflicts. By chance, is anyone running Clean and Simple and Red Rocket Basement (NX-2C Edition) together, and if so, are there any issues? In response to post #57914361. #57920616, #57940731 are all replies on the same post. 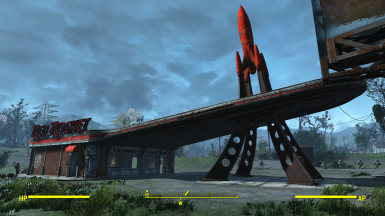 Shadowhawk25 wrote: For some reason, red rocket will revert to a damaged state with the fuel arms and weird domes on the ground randomly. I have this mod basically at the last of my load order, so I'm unsure what's up with it randomly going back. jenncave wrote: do you have scrap everything? Shadowhawk25 wrote: Yes, it's one of the last things in my load order. I had it before and it was fine, it just randomly stopped being repaired recently. Here is a video to show you a faster way to do what you are talking about. I abhor typing if I don't need to. i downloaded this mod yesterday and the walls seem to have disappeared and i can walk through where they should be. this was both on my current and new saves. Have you tried putting this mod very last? Is there any way to use this mod and keep the original trees and bushes? You can remove the records in FO4EDIT. I do not have the time to make additional mods. Hi jenncave, sorry it took so long,wasn't paying attention. v2.3 - 2 files. Installed with NMM and checked they were both their. I have the mod towards the end of load list before Sanctuary Hills Restoration and Scrap Everything. Been scoping out a few of your C&S mods for when (um... if? lol) I start a new game, and fell in love with this one the moment I saw it. Very nice (and clean and simple!). Even with the repairs to the meshes on that top part that rings around the station, I'm guessing that it's still compatible with Red Rockets' Glare? (I think he only fiddled with the materials and textures for the glow effect.) Thanks. Thanks. It's actually just loose material/texture files so there's no way to really load it "after" but, no worries, when the time comes I'll figure it out. My understanding is that loose files should override ba2's but I've found that's not always the case. E.G. Using the vivid textures "all in one" (a ba2 that included some power armor frame retexts) overrode my loose file PA frame retextures. Surprisingly, even packing those textures into a ba2 and loading the dummy esp after the vivid one didn't work - I actually had to unpack the vivid ba2 and remove its PA frame textures. "Warning, though, I might be back with more Q's, as my "figuring out" stuff is kinda hit and miss. " Just thought I'd follow up to confirm that it works fine with Red Rocket's Glare. Looks fantastic! 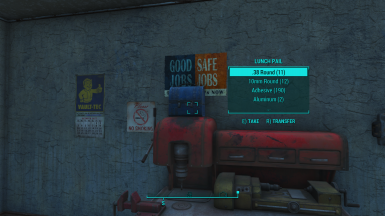 Also, and this could easily be a glitch in my game or just some anomoly, as I had a similar "problem" with Transfer Settlements (scare quotation marks only - got everything to work eventually), but for whatever use the info provides: I first installed this mod after scrapping everything (manually, no "scrapall") including the toolbox and it worked perfectly.Since I got all scrap components x2 - in workbench and in the lunchbox - it felt kinda cheaty so I went back to a save I made at RR just before installing (i.e. to get just the scrap in the lunchbox) and the walls/roof had disappeared. Went back one more save to where I was in a different cell (close though, in Sanctuary), and got the same thing. If a similar glitch hadn't happened with TS, I woulda been quite surprised since I thought loading the save prior to installing a mod was a foolproof way to troubleshoot, i.e. a clean "do-over". Iirc, (sorry, shoulda posted immediately, going from best recollection here), I fixed it simply by either (i) going back to a save in Railroad HQ and fast-travelling to Sanctuary then going to the cell, or (ii) uninstalling, going to the save before installing initially, making another save, then installing and loading up that save. Think it was (ii) but, damn... can't remember for sure. In the end tho, all's good. Lovin' this mod! Just some long-winded, and possibly irrelevant, info for ya. Hope it made sense anyways. Yes, because it uses a new mesh, you may have issues like that. But you did as I would have suggested by reinstalling the mod. First of all: Great mod(s). Love them. My Red Rocket walls keep disappearing though. Does not happen with any other location. I don't use other mods that mess with Red Rocket. Reinstalling does not work either... Any ideas? Are you using this stand alone mod or are you referring to this location in the merged file? I am using the merged file. Thank you, seems to be working now! Expect full endorsements from me^^ Essential mods! Hi jenncave, using 2.2 and also in 2.1 those domes showed up. Don't have any other Red Rocket mods. 2.0 was fine. Ok, you don't have the right mesh either....The pump arms are still there...Let me figure out somethings. Thanks, I don't mind that concrete slab with the pumps on it, it is a gas station after all. 2.3 didn't work for me. I am pretty sure that I got that fixed now. For some reason, that mesh was not getting packed in the archive. Give it a whirl and let me know. 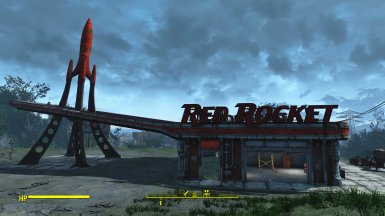 This mod overwrites the Repaired Red Rocket mod by Vlits, at least for this location. I tried adjusting the load order and reinstalling the meshes, but the Red Rocket building in your mod still takes precedence. This is fine, except I really hate all that damaged trim around the top of the building and the damaged letters on top of the building. Is there any chance you can borrow Vlits' mesh or do a similar repair job? I should add that previous versions of this mod did not effect the Repaired Red Rocket mod. The Repaired Red Rocket mod's latest version adds glass to the windows and doors, in a choice of clear or reinforced. All versions removed the pump arms. However, your mod overall, does a much better job. It is just that really annoying piece of bent trim on the back edge of the building prevents me from using my usual build design at this location. I know, I want the best of both mods combined, but it doesn't hurt to ask. Hey, my files are packed in an archive which is most likely why they take over. I am just getting into learning how to edit meshes in a separate program so I can't make my own just yet. I can upload a version of this file without that mesh if you like until I figure that out. Would you like that? Yes, I would like that, if it isn't too much trouble. However, I use your combined mod, not this standalone one. Wow, that was fast. about 2 hrs not 2 days. Thanks. It all works together perfectly now. I just updated and love the repaired RR!!! I always was unhappy with the cladding along the roof that hung half way off the building. It limited where you could put stairs up the back of the building if you wanted the stairs to be right against the building. Not to mention those half fallen off pieces actually got in the way of electrical wires at times. Hop over to VlitS page and give him an endorsement. He let me use his mesh. Link in the description. I want to thank you for your beautiful work that allow us to work less and enjoy more of the gameplay. Thanks a lot!! Each of those also has a circular illuminated area on the ground underneath it that's unselectable. There's also two floating glare lights viewable only from above that are leftover from the rocket spotlights. All of the lights are now linked to an emergency light that is stuck to the side of the workbench. Scrap it to turn off the lights. Just wanted to say thanks again for this, I really appreciate the amazingly-fast response and even faster work to enable a clean ability for them. You rock !